The humble Raspberry Pi has been put to many uses by hobbyists over the years since it was launched, but the latest use for the board is certainly very novel: bundling loads of the things together to make a cheap supercomputer (of sorts). 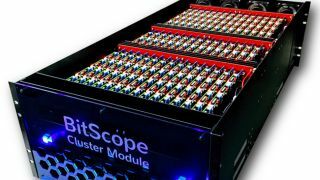 As Anandtech reports, the High Performance Computing (HPC) division over at the Los Alamos National Laboratory has lumped 750 Raspberry Pi boards together, in a system designed (and built) by BitScope that consists of five rack-mounted Pi Cluster Modules, each of which have 150 boards apiece. That means 750 processors with a total of 3,000 cores, which the National Laboratory notes makes for a very effective HPC testbed for software developers and researchers who can’t afford to pay for time on a real supercomputer. In other words, this isn’t a ‘true’ supercomputer, but an inexpensive development testbed of a similar scale, or as the makers put it, a “highly parallelized platform for test and validation of scalable systems software technologies”. Nifty, eh? So it seems that the Raspberry Pi isn’t just about low-cost hobbyist computing, but low-cost supercomputing – or at least facilitating the development and testing of software for the latter.